Bronchitis is an inflammation of the bronchial tubes, the part of the respiratory system that leads into the lungs. Acute bronchitis has a sudden onset and usually appears after a respiratory infection, such as a cold, and can be caused by either a virus or bacteria. The infection inflames the bronchial tubes, which causes symptoms such as fever, cough, sore throat, wheezing, and the production of thick yellow mucus. 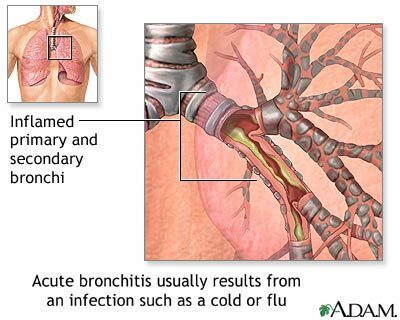 If acute bronchitis occurs because of a bacterial infection antibiotics are given for the treatment. Otherwise if the infection is viral medications can only be given to alleviate the symptoms. Although acute bronchitis is relatively common, some people are more prone to it than others.